Chef Parind Vora is a classically trained chef in the old vernacular. Born in Mumbai (Bombay), India, his family emigrated to the U.S. in 1976. Since arriving he has lived in New York City, West Virginia and South Carolina. He eventually found his way into restaurant work as a teenager. A few years later, he attended St. Matthews University; School of Medicine. While there, Parind was in the top 15% of his Medical school class. He was passionate about the world of medicine but could never quite shake his love of food. During the final part of his third year of medical school, Parind decided that the kitchen was where he belonged. He left St. Matthew's and resumed his travels, soaking up as much food knowledge as he could along the way. Parind's globetrotting has since come to define his cooking style. He is essentially self taught in theory but was mentored by his travels, both domestically and abroad. Growing up in an Indian household, the first concept he mastered was the use of spices and their flavor combinations. Each part of the world he has visited since then has added a layer of complexity to his cooking. Every food experience he had left an indelible mark on his cuisine. His cuisine is now described as "Modern American," but is culturally honest and done with a unique approach. 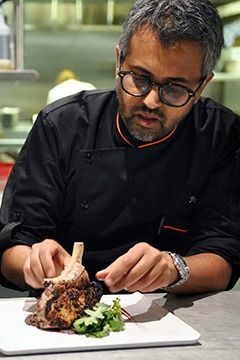 Parind seeks to meld classic technique with subtle Indian seasoning and world influences. Alongside his genuine devotion to fine wine, this combination makes for unmistakable American food. This taste for powerful flavor combinations doesn't go unnoticed. Since opening Jezebel, he has been invited to cook for the oldest winery in Spain as well as the world renowned James Beard House in New York City. Parind's food has big flavors and is seasoned assertively, yet is nuanced, complex, and most importantly, balanced. He creates the entire menu at Jezebel in order to take advantage of local, seasonal products...a menu that can only come from skill, understanding and exuberance. As Parind launched his global catering business he is catering from Europe, Caribbean to any city in the US. Please inquire at info@restaurantjezebel.com. His love of cooking mandate that Restaurant Jezebel stays open and now will be available on limited schedule. Please check the Jezebel open dates tab and reserve soon to prevent disappointment.